Posted on December 15, 2016 at 3:04 pm. The Commercial Hotel in South Morang, where an application for 40 new pokie machines has been refused. The Victorian Commission for Gambling and Liquor Regulation has made what’s being called a “landmark” decision by knocking-back an application for the Commercial Hotel in South Morang to add an additional 40 electronic pokie machines. The pub, which is owned by Woolworths, lies within the Whittlesea area, which records some of the worst pokies losses in the state. If the additional pokie machines were approved, it was expected they’d bring the Commercial Hotel’s annual revenue up to between $5.6 and $6.2 million, while having negative ramifications for the community. The gambling commission cited the “consistent and sustained negative attitude by the community” as part of the reason for denying the application. Tim Costello, member of the Alliance for Gambling Reform, took the application denial as a small victory. Whittlesea major, Ricky Kirkham, shared Mr Costello’s sentiments, saying the decision will save the South Morang community millions of dollars each year while preventing social problems and family breakdowns. Mr Kirkham said, “The City of Whittlesea is already paying a terrible price for existing poker machines with over $103 million lost to poker machines each year by our residents. Owners of the Commercial Hotel intend to appeal the decision on the grounds that the additional machines would allow the pub to offer “broader entertainment” to local residents. 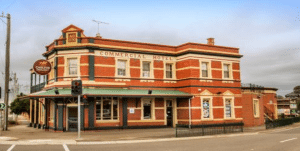 The Australian Leisure & Hospitality Group (ALH), who are working on behalf of the Commercial Hotel, have 28 days from December 12th to appeal the decision. The Whittlesea area currently has the seventh highest rate of pokie machine losses of any municipalities in Victoria. You’ve got to admire the balls on the ALH for citing the offer of broader entertainment as the reason The Victorian Commission for Gambling and Liquor Regulation should overturn its decision – we’re sure that extra couple of million in revenue each year has nothing to do with it. While we agree with Costello and Kirkham that the application denial is a positive step towards minimising community harm caused by the pokies, there’s every chance the commission will agree to the ALH’s appeal, so until then we wouldn’t be urging South Morang to celebrate the victory just yet.